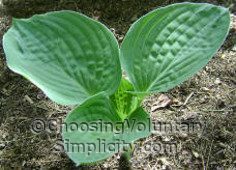 Home » Growing Hostas / Reader Questions » Do Hostas Seed Themselves? 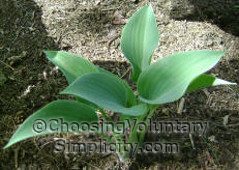 Reader question… “I have what I think is a hosta seedling growing in my garden, but it is not near my other two hostas. I have not planted any seeds. Is there any way that one of my hostas seeded itself? Can you tell me how I could positively identify whatever this is? I have never actually seen a hosta seedling, but this does look like a baby hosta (I think). My other question is, is this seedling worth saving?” –Laurie P.
This must be an extraordinarily good year for self-sown hosta seedlings, because so many of you have written recently about hostas self-sowing. 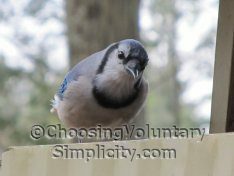 We are finding an incredible number of seedlings here too in some very interesting places… many are popping up nearly a hundred feet away from the nearest hosta, so I guess I have birds or perhaps squirrels or chipmunks to thank for distributing the seeds. Personally, I do think these seedlings are worth saving. 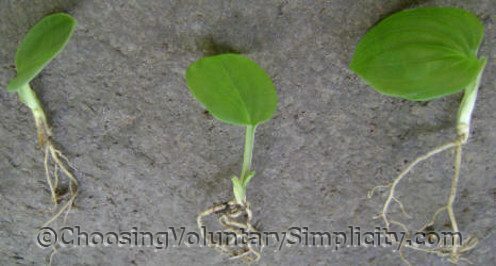 Usually they have a well-developed root system for their size, and they have already proven what a strong little plant they are. We transplant these tiny “volunteers” to a nursery area (we call it the HICU :o)) and leave them for at least a year so they can grow big enough to be moved to a bigger nursery area or to a garden. It’s always a surprise to see the hostas these seedlings become. We have had self-sown seedlings develop colored edges, variegation, twisty and rippled leaves… different leaf colors and shapes, a range of sizes from miniatures to huge… it definitely is not true that all “ordinary” seedlings develop into “plain green” hostas. I have to say I love the hostas – they are such a hardy plant and man do they ever grow! We just bought a home last year and my parents are giving us some of their (ever overgrown) hostas to plant along the fence near our driveway. Great looking, low maintenence. Gotta love them. Does anyone know if spring or fall is better time to plant them? p.s. my second time to your blog and I love it! HICU – thats too funny! very interesting post. Now that I can see what they look like I’m off to look for seedlings. I found one seedling and I have planted it. It is very small and I hope it doesn’t die. BTW wanted to say I like your writing. I check this site every day. I was told to soak seeds overnite and the ones that sink are good seeds. My hosta seeds are floating. Are they good do you think. I cared for them properly. Thanks from Florida. Lena, if your hosta seeds have a “bump” at one end that you can see and feel and the seeds are black, they probably will germinate. You can see what they should look like here. I wouldn’t rely on the soaking and floating method. I have had volunteer hostas for several years now, and they seem to be fast growing large leafed plants…I have over 50 hostas in my shady yard, and many are the giant size…these volunteers have been transplanted into bare areas an thrived…each spring I am excited to uncover new plants. The last two years my hostas have gone wild-crazy! they are seeding EVERYWHERE! In cracks in the patio..out in the yard. This is insane! ;) I live in Illinois btw! I to have 100’s of hosta seedlings and I live in a high mountain valley in Vermont. I have blue hosts that have reseeded themselves over the past three years to such an extent that they’re now invasive! I was startled and excited when I discovered that my hostas were spreading seeds by themselves. I thought I was crazy when I saw them coming up so far away from the mother plants. All I had ever known was hostas growing in clumps – never would I have believed that they spread their own seeds. I love watching where they pop up and a lot of them are the large variety. None of my really “special” varieties seem to be doing this but no complaints. I will take free plants anytime that I don’t have to grow & plant myself! I live in Iowa.